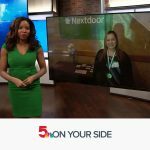 It was an awesome day at #STLBOA We recognized Jessica Bueler & Welcome Neighbor STL for all of the work they have done for Syrian Refugees in #STL It all started with a post on Nextdoor. As Jessica said, you don’t need an invitation to help out a neighbor! Thank you for all of your hard work! 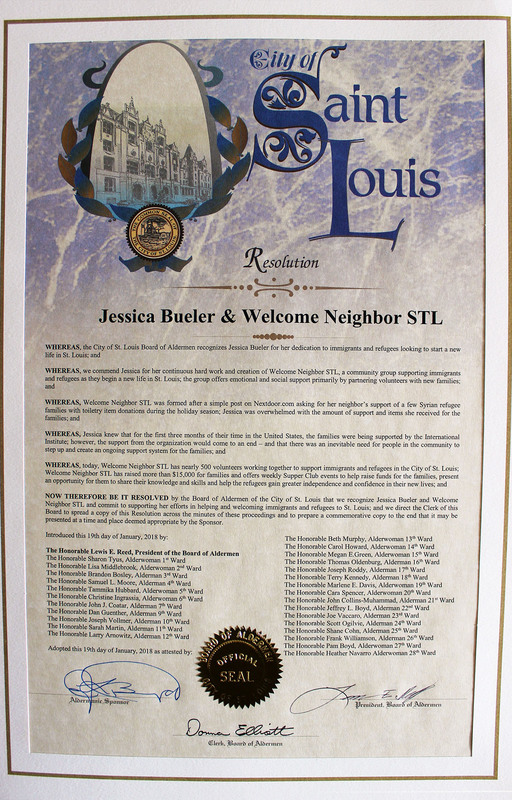 The Board of Aldermen recognize Jessica Bueler and Welcome Neighbor STL. We are so proud of Jessica Bueler. She literally can do anything she puts her mind to. 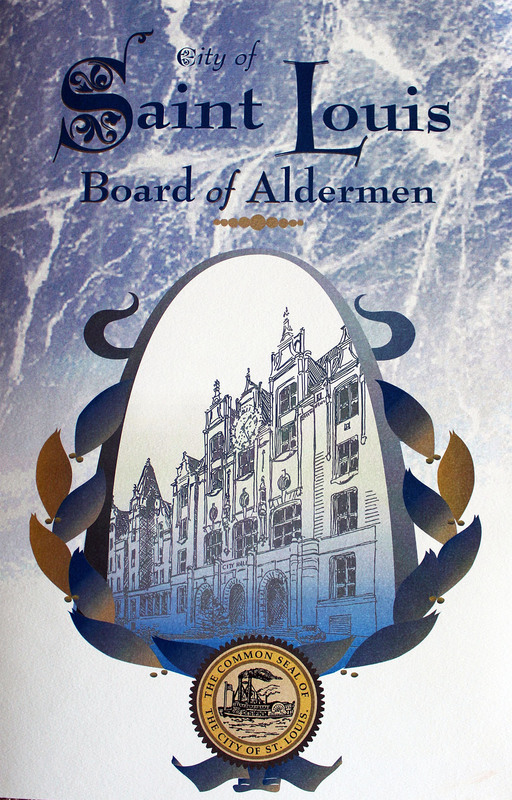 Congratulations on receiving the highest honor that a citizen/organization can achieve in the City of St. Louis. 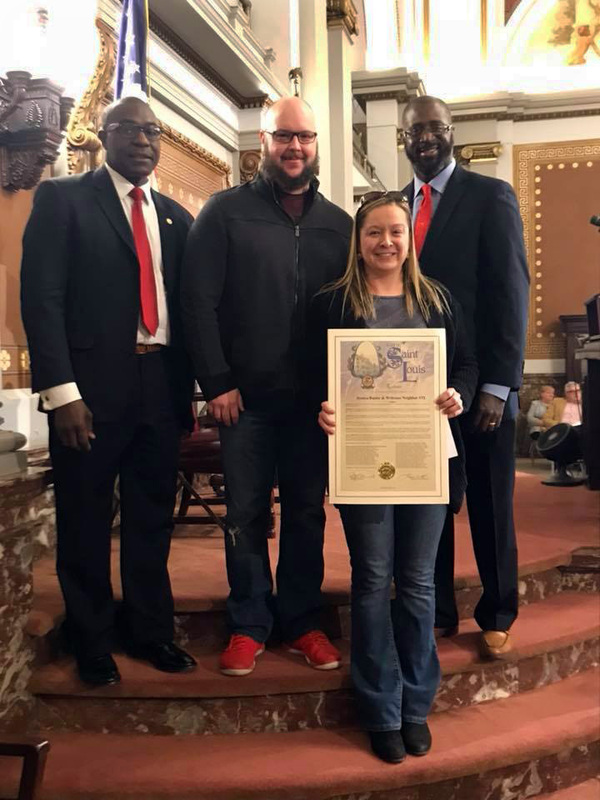 Over a year ago she took a simple idea of running a toiletry drive during Thanksgiving to help refugees in St. Louis who have been displaced and are finally trying to establish roots. After their first 3 months in America, they were on their own with almost zero support systems in place. Jessica saw an opportunity to use her reach to ask for community support to help these people who are in dire need of support. She continuously works with volunteers to help improve the quality of the refugees lives. She has raised over 14 thousand dollars to help move some of the refugee families out of the dirty, almost condemnable accommodations these refugees are placed into. some of the kids had lead poisoning from the paint, others had infestation of bugs, ETC. Jessica and the volunteers helped raise money to help the families pay their first/last month payments free and clear so they can move into a clean and safe living environment. 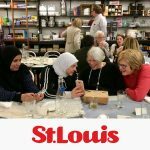 As of right now, Welcome Neighbor STL has over 1,300 volunteers and continues to make a difference in the lives of refugees here in St. Louis.